Courtesy of Drake’s InstagramDrake may hail from Toronto, but he’s always had an affinity for Houston, Texas. The rapper has revealed his latest tattoo, which celebrates his home away from home. 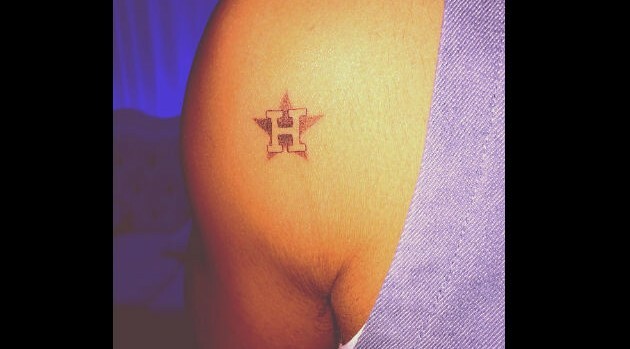 Drizzy posted an Instagram picture of his newest ink: a retro Houston Astros logo. In the accompanying caption he wrote, “November 18th H Town,” which serves as a nod to his DJ Screw-produced song, “November 18th,” lifted from his So Far Gone mixtape. In other news, Drake will show love to the West Coast as his Would You Like a Tour pulls into Anaheim, California on November 21.